“The decision reflects the EU's wish to fully engage with Turkmenistan in areas of strategic interest such as security, human rights, energy, climate, and the rule of law,” Mogherini’s office said in a statement. 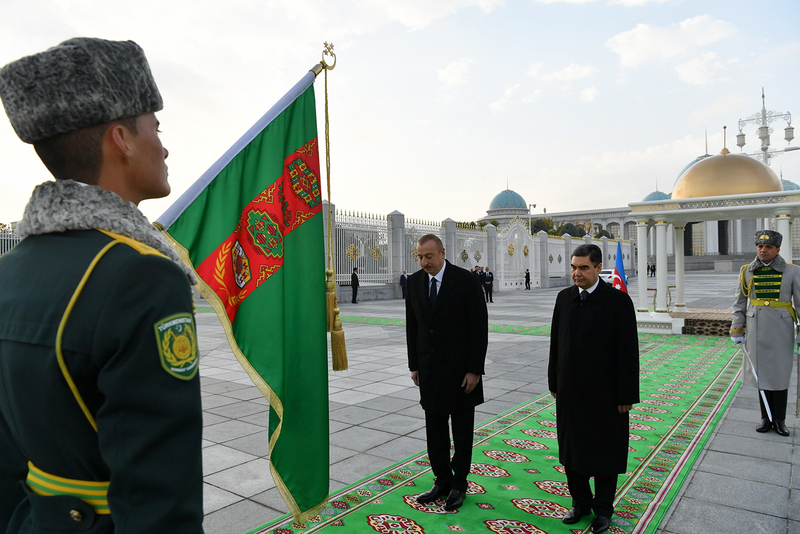 As it happens, Azerbaijan’s President Ilham Aliyev paid an official visit to Turkmenistan on November 21-22. Turkmenistan and Azerbaijan have been engaged in Turkey-brokered negotiations on a putative agreement on the transportation of gas to Europe since 2015. But there are sticking points, most notably the still-unsettled underwater border between the two nations. Given that the Caspian seabed is a patchwork of rich hydrocarbon reserves, this is not a straightforward matter. Aliyev’s tête-à-tête with his Turkmen counterpart Gurbanguly Berdymukhamedov did not produce any breakthroughs that were made public. Nonetheless, state media reported in its usual glowing terms on the signing of 21 agreements on bilateral cooperation, including one on trans-Caspian shipping. A joint statement called for further work on delimitation of the seabed but made no reference to pipelines. Turning to an energy transportation project on Turkmenistan’s eastern flank, state media reported something looking like progress on the Turkmenistan-Afghanistan-Pakistan-India, or TAPI, pipeline. State-run Turkmengaz, which is leading the project, is taking receipt of $40 million worth of steel pipes from Saudi Arabia's Global Pipe Company. Financing for the 35 kilometers of pipe were reportedly provided by the Saudi Fund for Development. These energy initiatives are all-important because other sectors of the economy are constrained by Ashgabat’s utter disdain for basic freedoms. Away from the high drama of pipeline diplomacy and legal disputes, the population in Turkmenistan trudges on in its desperate bid to eke out an existence. Websites like the Vienna-based Chronicles of Turkmenistan and the Netherlands-based Alternative News of Turkmenistan, or ANT, attempt to peek behind the ceaseless whitewashing by state media. This kind of reporting is done at high cost. Reporters working for these outlets are routinely harassed and even jailed. And government attempts to counter independent media may even be getting more sophisticated. ANT said on November 22 that after it published a series of articles revealing more aspects of soaring poverty rates in Ashgabat, its website endured a welter of cyberattacks.